Occasionally, older patients express concern that their age may prevent them from enjoying the benefits of dental implants. Health is more of a determining factor than age, If you’re healthy enough to have a tooth extracted, you’re probably healthy enough to receive dental implants. 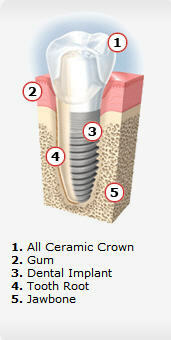 Certain chronic diseases may contraindicate dental implant treatment. Your dentist will determine if you're a candidate for dental implants after careful evaluation of your dental & health history.